CHICAGO — Thanksgiving is coming up this month, so American Coin-Op asked self-service laundry owners to answer some questions with thankfulness in mind. Their responses when asked about current business-related conditions were hugely positive, based on the results of this month’s Your Views survey. American Coin-Op asked its trade audience if they agreed with the following statement: “I’m thankful, because our operation is performing well.” More than 84% of respondents said they agreed, while 15.8% said they weren’t sure. No one who took the survey disagreed with the statement. Another statement: “Our equipment works well and isn’t a concern.” The level of agreement was less concentrated, yet the feeling was still overwhelmingly positive. Roughly 47% “completely agree” with the statement and another 44.7% “somewhat agree.” Much smaller shares “neither agree nor disagree” (5.3%) or “somewhat disagree” (2.6%). No one who took the survey “completely” disagreed. 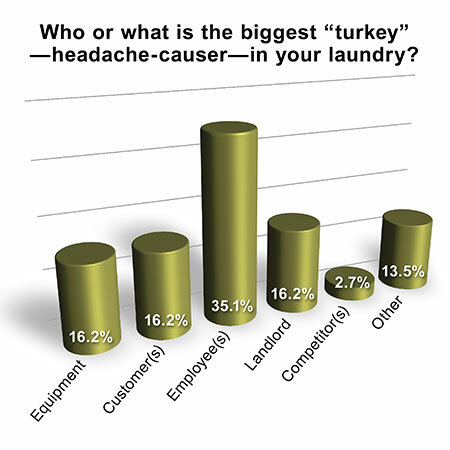 The magazine also asked respondents to name one aspect of their business for which they are most thankful. The most popular responses related to loyal customers, good employees, and the provision of a steady income. While the Your Views survey presents a snapshot of readers’ viewpoints at a particular moment, it should not be considered scientific. Subscribers to American Coin-Op’s Wire e-mails are invited to take the industry survey anonymously online each month. Percentages may not add up to 100% due to rounding.